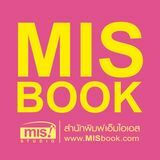 วิเคราะห์ขอ้ สอบ แบบทันสมัยทีส่ ดุ พร้อมแบบฝึกหัดเสริมทักษะ 14TH EDITION Pamela J. Sharpe, Ph.D.
® TOEFL is a registered trademark of Educational Testing Service (ETS). This publication is not endorsed or approved by ETS. 14TH EDITION Pamela J. Sharpe, Ph.D.
TOEFL速 iBT is a registered trademark of Educational Testing Service (ETS). This publication is not endorsed or approved by ETS. To my students at home and abroad with best wishes for success on the TOEFL and after the TOEFL About the Author Dr. Pamela Sharpe is an internationally recognized educator in the field of English as a second language (ESL). She has been a member of the faculty at many prestigious colleges and universities in the United States including the University of Florida, University of Texas at Austin, Miami Dade Community College, and the Ohio State University. In addition, she was the founding director of the American Language Institute at the University of Toledo, a curriculum specialist for federal bilingual education programs, and chair of Modern Languages at Arizona Western College. As a member of the statewide television faculty of Northern Arizona University, she taught graduate courses for teachers via the interactive television network throughout the state of Arizona. She has received numerous awards for teaching. An educational consultant for schools across the globe, Dr. Sharpe has been actively involved in teacher training and development both in the United States and as a Fulbright Scholar in Latin America. Dr. Sharpe is a preeminent authority in test preparation for the TOEFL and the TOEIC. 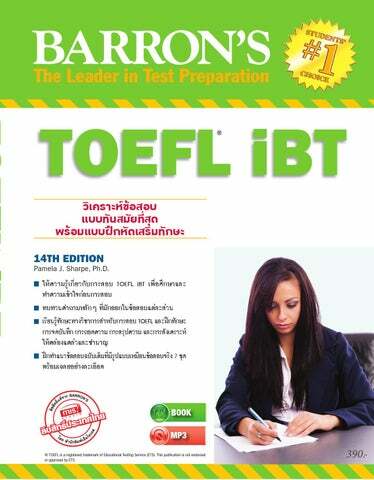 Her text, Barron’s TOEFL iBT is in the fourteenth edition, and has been a consistent best seller worldwide. She has published twelve books, including four for TOEFL preparation that have been used successfully by millions of students. She earned her bachelor’s degree Phi Beta Kappa with honors from the Ohio State University, her master’s degree in Linguistics from the University of Florida, and her Ph.D. in TESL, the Teaching of English as a Second Language, from the Ohio State University. ACKNOWLEDGMENTS With affection and appreciation, I acknowledge my indebtedness to the friends, family, and colleagues who have been part of the TOEFL team for so many years. John T. Osterman, my husband—a special thank you for the unconditional love and the daily interest in and support for my writing career, as well as for checking my math in the evaluation tables. Each revision of this book is better than the last, and every new and revised year with John is the best year of my life. PERMISSIONS “Altruism” Excerpt pp. 1138–1140 from BIOLOGY, 8th ed., by Neil A. Campbell et al. Copyright © 2008 by Pearson Education, Inc. Reprinted by permission. “Beowulf” From World Mythology, 3rd ed., by Donna Rosenberg. © 1998 by National Textbook/McGraw Hill Education. This material is reproduced with the permission of The McGraw-Hill Companies. “Building with Arches” From Gilbert’s Living with Art, 8th ed., by Mark Gettein. Copyright © 2008 by The McGraw-Hill Companies, Inc. Reproduced with permission of The McGraw-Hill Companies. “Civilization” From SPEILVOGEL. Western Civilization, 7E. © 2009 Wadsworth, a part of Cengage Learning Inc. Reproduced by permission. www.cengage.com/permissions. “The Evolution of Birds” Excerpt pp. 718–719 from BIOLOGY, 8th ed. by Neil A. Campbell et al. Copyright © 2008 by Pearson Education, Inc. Reprinted by permission. “Exotic and Endangered Species” From Starr/Taggart. Biology: The Unity and Diversity of Life w/CD & Info Trac, 10E. © 2004 Brooks/Cole, a part of Cengage Learning, Inc. Reproduced by permission.www.cengage.com/ permissions. “Four Stages of Planetary Development” From SEEDS. The Solar System, 6E. © 2008 Brooks/Cole, a part of Cengage Learning, Inc. Reproduced by permission. www.cengage.com/permissions. “Geothermal Energy” From Environmental Science: Earth as a Living Planet, 6th ed., by Botkin/Keller. Copyright © 2007 by John Wiley & Sons, Inc. Reprinted with permission of John Wiley & Sons, Inc. “Group Decision Making” From LEWIS/COODMAN/FANDT. Management, 4E. © 2004 South Western, a part of Cengage Learning, Inc. Reproduced by permission. www.cengage.com/permissions. “The Heredity Versus Environment Debate” From ORNSTEIN. Foundations of Education, 10E. © 2008 Wadsworth, a part of Cengage Learning, Inc. Reproduced by permission. www.cengage,com/permissions. “The Hydrologic Cycle” From Environmental Science: Earth as a Living Planet, 6th ed., by Botkin/Keller. Copyright © 2007 by John Wiley & Sons, Inc. Reprinted with permission of John Wiley & Sons, Inc.
“Jackson Pollock” Photo: © 2009 The Pollack-Krasner Foundation/Artists Rights Society. “Layers of Social Class” From ANDERSEN/TAYLOR. Sociology, 5E. © 2009 Wadsworth, a part of Cengage Learning, Inc. Reproduced by permission. www.cengage.com/permissions. “Life In Our Solar System” From SEEDS. Horizons, 11E. © 2010 Brooks/Cole, a part of Cengage Learning, Inc. Reproduced by permission. www.cengage.com/permissions. “Looking at Theatre History” From Oscar G. Grockett & Franklin J. Hildy. History of the Theatre, 10/e. Published by Allyn and Bacon/Merrill Education, Boston, MA. Copyright © 2008 by Pearson Education. Adapted by permission of the publisher. “Migration from Asia” Faragher, John Mack; Czitrom, Daniel; Buhle, Mari Jo; Armitage, Susan H, OUT OF MANY: A HISTORY OF THE AMERICAN PEOPLE, COMBINED VOLUME, 5th ed., © 2006. Reproduced by permission of Pearson Education, Inc., Upper Saddle River, New Jersey. “New Women of the Ice Age” PRINGLE, HEATHER. Applying Cultural Anthropology: An Introductory Reader, 6th ed., by Aaron Podolefsky, Peter J. Brown. Published by The McGraw-Hill Companies, Inc. Copyright © 2003. Reprinted by permission of the author. “Organic Architecture” From KLEINER. Gardner’s Art through the Ages, 13E. © 2009 Wadsworth, a part of Cengage Learning, Inc. Reproduced by permission. www.cengage.com/permissions. “Paleolithic Art” From KLEINER. Gardner’s Art through the Ages, A Global History 13E. © 2009. Wadsworth, a part of Cengage Learning, Inc. Reproduced by permission. www.cengage.com/permissions. “Piaget’s Cognitive Development Theory” From Life-Span Development, 12/e, by John W. Santrock. Published by The McGraw-Hill Companies, Inc. © 2009. Reprinted with the permission of The McGraw-Hill Companies, Inc.
“Producers, Consumers, and Decomposers” CHRISTOPHERSON, ROBERT W., GEOSYSTEMS: AN INTRODUCTION TO PHYSICAL GEOGRAPHY, 7th ed., © 2009. Reproduced by permission of Pearson Education, Inc., Upper Saddle River, New Jersey. “Prosperity in the Early Empire” SPIELVOGEL. Western Civilization, 7E. © 2009 Wadsworth, a part of Cengage Learning, Inc. Reproduced by permission. www.cengage.com/permissions. “Resources and Industrialism in Canada” Excerpt pp. 222–223. From A Brief History of Canada, 2nd ed., by Roger Riendeau. Published by Facts on File, Inc. © 2007. Reprinted by permission. “Rising Sea Levels” CHRISTOPHERSON, ROBERT W., GEOSYSTEMS: AN INTRODUCTION TO PHYSICAL GEOGRAPHY, 7th ed., © 2009. Reproduced by permission of Pearson Education, Inc., Upper Saddle River, New Jersey. “Social Readjustment Scales” From WEITEN/LLOYD/DUNN/HAMMER. Psychology Applied to Modern Life, 9E. © 2009 Wadsworth, a part of Cengage Learning, Inc. Reproduced by permission. www.cengage.com/ permissions. “Solar Energy” CHRISTOPHERSON, ROBERT W., GEOSYSTEMS: AN INTRODUCTION TO PHYSICAL GEOGRAPHY, 7th ed., © 2009. Reproduced by permission of Pearson Education. “Speech and Writing” From Language Files 10, 10th ed. Department of Linguistics, the Ohio State University. Copyright © 2007 by the Ohio State University. Reprinted with permission of the publisher. “Symbiotic Relationships” From Environmental Science—A Study of Interrelationships, 11/e by Elson D. Enger and Bradley F. Smith. © 2008 by McGraw-Hill Companies. This passage is used with the permission of The McGraw-Hill Companies. “Tattoo in Polynesia” From KLEINER, Gardner’s Art through the Ages, 13E. © 2009. Wadsworth, a part of Cengage Learning, Inc. Reproduced by permission. www.cengage.com/permissions. “Thermoregulation” Excerpt pp. 864–866 from BIOLOGY, 8th ed. by Neil A. Campbell et al. Copyright © 2008 by Pearson Education, Inc. Reprinted by permission. “Weather and Chaotic Systems” From The Cosmic Perspective, 5th ed., by Jeffrey Bennett, Megan Donahue, Nicholas Schneider and Mark Voit. Copyright © 2008 Pearson Education, Inc. publishing as Addison Wesley. Reprinted by permission of Pearson Education, Inc.
Organisms that are capable of using carbon dioxide as their sole source of carbon are called autotrophs (self-feeders), or producers. These are the plants. They chemically fix carbon through photosynthesis. Organisms that depend on producers as their carbon source are called heterotrophs (feed on others), or consumers. Generally, these are animals. From the producers, which manufacture their own food, energy flows through the system along a circuit called the food chain, reaching consumers and eventually detritivores. Organisms that share the same basic foods are said to be at the same trophic level. Ecosystems generally are structured in a food web, a complex network of interconnected food chains. In a food web, consumers participate in several different food chains, comprising both strong interactions and weak interactions between species in the food web. Detritivores (detritus feeders and decomposers) are the final link in the endless chain. D Detritivores renew the entire system by releasing simple inorganic compounds and nutrients with the breaking down of organic materials. Detritus refers to all the dead organic debris—remains, fallen leaves, and wastes—that living processes leave. Detritus feeders—worms, mites, termites, centipedes, snails, crabs, and even vultures, among others—work like an army to consume detritus and excrete nutrients that fuel an ecosystem. Decomposers are primarily bacteria and fungi that digest organic debris outside their bodies and absorb and release nutrients in the process. This metabolic work of microbial decomposers produces the rotting that breaks down detritus. Detritus feeders and decomposers, although different in operation, have a similar function in an ecosystem. An example of a complex community is the oceanic food web that includes krill, a primary consumer. Krill is a shrimplike crustacean that is a major food for an interrelated group of organisms, including whales, fish, seabirds, seals, and squid in the Antarctic region. All of these organisms participate in numerous other food chains as well, some consuming and some being consumed. Phytoplankton begin this chain by harvesting solar energy in photosynthesis. Herbivorous zooplankton such as krill and other organisms eat Phytoplankton. Consumers eat krill at the next trophic level. Because krill are a protein-rich, plentiful food, increasingly factory ships, such as those from Japan and Russia, seek them out. The annual krill harvest currently surpasses a million tons, principally as feed for chickens and livestock and as protein for human consumption. Efficiency in a Food Web Any assessment of world food resources depends on the level of consumer being targeted. Let us use humans as an example. Many people can be fed if wheat is eaten directly. However, if the grain is first fed to cattle (herbivores) and then we eat the beef, the yield of available food energy is cut by 90% (810 kg of grain is reduced to 82 kg of meat); far fewer people can be fed from the same land area. In terms of energy, only about 10% of the kilocalories (food calories, not heat calories) in plant matter survive from the primary to the secondary trophic level. When humans consume meat instead of grain, there is a further loss of biomass and added inefficiency. More energy is lost to the environment at each progressive step in the food chain. You can see that an omnivorous diet such as that of an average North American and European is quite expensive in terms of biomass and energy. Food web concepts are becoming politicized as world food issues grow more critical. Today, approximately half of the cultivated acreage in the United States and Canada is planted for animal consumptionâ&#x20AC;&#x201D;beef and dairy cattle, hogs, chickens, and turkeys. Livestock feed includes approximately 80% of the annual corn and nonexported soybean harvest. In addition, some lands cleared of rain forest in Central and South America were converted to pasture to produce beef for export to restaurants, stores, and fast-food outlets in developed countries. Thus, lifestyle decisions and dietary patterns in North America and Europe are perpetuating inefficient food webs, not to mention the destruction of valuable resources, both here and overseas. They use a chemical process to produce their own food. They require plant matter in order to survive. They need producers to provide them with carbon. They do not interact with other organisms in the food chain. A Vocabulary problem asks you to choose a general synonym. Choose from four words or phrases. If you can anticipate the purpose of a reading or a lecture, you will be able to prepare your mind to receive the information, and you will already know how to organize your notes. Question What is it? What are the characteristics? Which group does it belong to? What is the order—first, second, and so on? How is it the same or different from something else? How does it cause something? What happens? Why is it a problem? What is the solution? Why should it be supported or rejected? The headings and subheadings in textbooks help you anticipate the purpose of the chapter or the sections within a chapter. For example, a heading in an earth science textbook that includes only one noun, The Atmosphere, will probably be a definition or a description of the atmosphere. A heading such as Forces Within the Atmosphere implies that several forces will be discussed and further implies that this will be a classification or perhaps a comparison and contrast of the forces. Atmospheric Patterns of Motion introduces a process and could anticipate a sequence or even a cause and effect. Problems in Predicting Weather is a heading that contains the purpose in the word problems. You know that this is a problem and solution section. Persuasion can usually be identified because of words like should and must as well as subjective or judgmental phrases like better or worse, whereas evaluation contains both sides of an issue. Did you understand? Try to anticipate the purpose of each section in a textbook by reading the headings and subheadings. Here are some headings and subheadings for practice. The first one is completed to give you an example. The answers are printed in Chapter 5 on page 509. Sometimes you will make a mistake anticipating the purpose. Your prediction will be different from the way that the reading or lecture proceeds. Don’t worry. Trying to predict is still a good idea, and you will become more skilled as you practice using other activities and tests in this book. The lectures on the TOEFL begin with an introductory screen followed by a narrator’s introduction. They will give you a general direction for your listening. Most of the time, the narrator will tell you in which class the lecture is given. Sometimes the narrator will also provide the main topic. Did you understand? Try to anticipate part of the narrator’s introduction by viewing the introductory screen. Here are some introductions to lectures for practice. The first one is completed to give you an example. The answers are printed in Chapter 5 on pages 509–510. Activity 2, CD 2, Track 1. Listen to part of a lecture in ________________________________________________. A good lecturer will also give you ways to anticipate the purpose of a lecture or part of a lecture with verbal cues. Sometimes the lecturer will announce the topic in such a way that the purpose is directly stated. Other times you will have to draw a conclusion. Although the topic is stated at the beginning of the lecture, there may be some references to previous lectures or some classroom business to conclude before the topic is announced. When the topic for a lecture is stated, the lecturer may either pause just before saying the topic or stress the topic by raising the volume or using very clear pronunciation. To be a good listener, you should prepare your mind to accept the information. If you know which class the lecturer is teaching, you already know how to focus your attention. By hearing the cue that identifies the topic, you have a context for the rest of the lecture. Did you understand? Try to anticipate the purpose of a lecture by listening to the beginning of it. Here are some short introductions to lectures for practice. The first one is completed to give you an example. The answers are printed in Chapter 5 on page 510. “Okay then, let’s get started. Uh, today we’re going to talk about the biosphere.” 1. Activity 3, CD 2, Track 2.
format that requires letters and numbers. Placement to the left or to the right of the line sorts the ideas in order of importance and shows their relationship. Did you understand? Try to put the information in the following sentence outline into twocolumn notes. Refer to the two-column format above as an example. The answers are printed in Chapter 5 on page 510. There are three arguments in support of protecting endangered species. I. Aesthetic justification states that the various forms of nature influence the life experience of human beings in a positive way. A. Many endangered species are uniquely beautiful. B. They are appreciated universally in art and literature. C. Some are important to the religious community. Ecological self-interest assumes that a balance of nature benefits all species. A. All species perform essential functions. 1.â&#x20AC;&#x201A; For example, an endangered species may be the unique carrier of a cure for a human disease. B. In order to protect ourselves, we must protect other species. Moral justification asserts that the creatures themselves have rights. A. The United Nations World Charter for Nature declares that all species have the right to exist. B. Human beings have the responsibility to preserve all species.